In a universe of numerous Safari plug-ins, Saft ( ; $12) is perhaps the most feature-loaded and indispensable of the bunch. 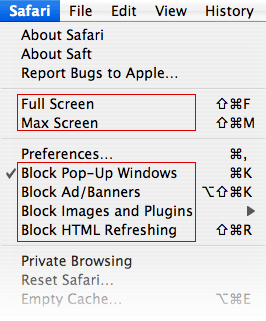 However, despite being mentioned in several Macworld articles (for example, Browse Better and The Secrets of Safari ), Saft hasn’t ever received the Mac Gems treatment…until now. Before I start talking about what Saft does, however, I want to talk briefly about how it works. Saft and other third-party plug-ins for Safari (and other applications) work by taking advantage of an Apple technology known by the name InputManager ( Apple’s very technical documentation ). Although InputManager wasn’t really designed as a way to add features to Web browsers, it turns out that InputManager is an effective way for developers to add their own code to that of another program, thereby providing features that the original program doesn’t include. InputManager is used by many plug-in solutions, including past Gems Chax (an iChat plug-in), CaminoSession (a Camino plug-in), and iGlasses (a plug-in that provides video tweaks to iChat). Some people prefer not to use InputManager plug-ins on their machines due to the possibility of security risks—consider that such plug-ins actually modify other applications. However, in my use of quite a number of InputManager plug-ins, I haven’t had any problems, but I do keep multiple current backups, just in case. Shortcuts: If you search many different Web sites, shortcuts can make the task much easier. Instead of visiting the Mac OS X Hints search page, entering your search term, and then clicking the Search button, you can just type osxh dashboard into the URL bar, for example, to search the Hints site for all Dashboard-related entries. Saft ships with a dozen or so predefined shortcuts, but you can easily add your own (or remove those you don’t use). Rearrange tabs: Apple’s Safari 3 public beta includes draggable tabs, but Saft adds this feature to the current version, as well. With multiple tabs open, just drag-and-drop to rearrange. Another setting lets you control where new tabs appear—on the left side of the tab bar, instead of the right, for example. Auto-hide downloads window: This is a small thing, but it’s especially useful on laptops: after a Safari download finishes, Saft will close the downloads window automatically. Sort bookmarks: A new Sort Bookmarks menu item appears in each Bookmarks menu, making it a snap to keep your bookmarks nicely sorted. Type-ahead find: Although not quite as slick as the new Find feature in Safari 3, Saft’s type-ahead find is quite useful. There’s no need to press Command-F to start a search; just start typing a few letters of your search term after a given page has loaded. Saft will highlight the first match on the page as you type. If you want to find the subsequent match, just press Command-G.
Control-drag to scroll a page: Another useful trick for laptops, especially older ones that lack a scrolling trackpad. Hold down the Control key and move your finger (or mouse), and the Web page will follow, scrolling up, down, left, or right. Auto-complete always on: Some Web sites, particularly banks and other financial institutions, code their pages to prevent browsers from automatically entering your username and password. While this is a very good idea from a security standpoint, it can be a bit of a pain—especially on a home computer that doesn’t travel. Saft has an option, disabled by default, that overrides the “do not remember” code on such sites, allowing Safari to memorize your username and password, and auto-complete them on your next visit.